Professional Christmas Holiday lighting installation serving Fayetteville, Farmington, Prairie Grove, Cave Springs, Elm Springs, Springdale and SW Rogers. Our holiday lighting installation service is sure to bring a smile to your face! Now you can let last year be the last year that you fret, fuss and fight with your holiday lights.You can trust the same team of professionals that makes landscaping easy, green and colorful for you to make your exterior decorating effortless, magical and bright for the holidays. Say “Good-bye” to DIY and “Hello” to the ease and beauty of professional installation. 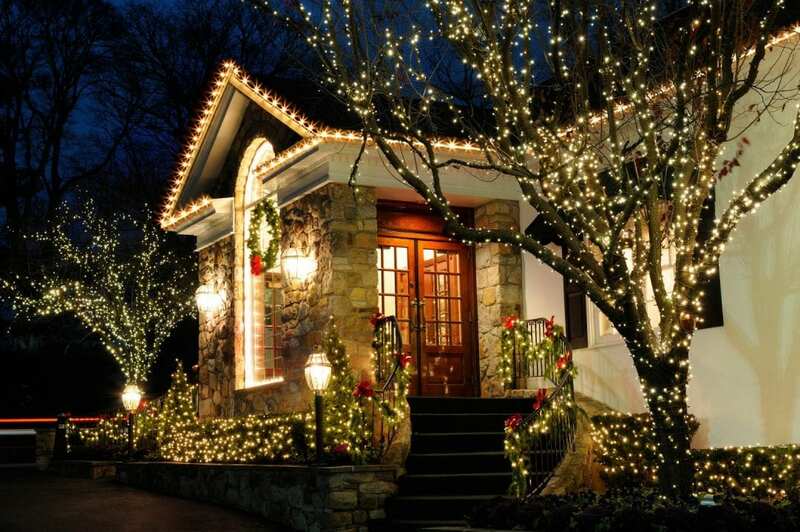 We will plan, provide, install, maintain, remove and even store your holiday lights! Transform “uh-oh” to “Ooo! Ah!” with one phone call.Call us today! 479-856-9800 or contact us here for a quote. Q. What is the difference between your lights and what is available at the local stores? A. Quality…Buy Cheap / Sell Cheap is the theory behind the big box stores holiday lights. The problem with this is that when something goes wrong they cannot be fixed. The homeowner then has to purchase a new set of replacement lights and pay for additional labor to have them reinstalled. The light sets that we provide allow us to repair all parts of the light – the wire, the bulb, the plugs, and the outlets. In addition to the longevity of the commercial grade two-way wire lights we provide, our custom lights allow us to fit the lights to your home precisely. Q. Am I buying the holiday lights and decorations? A. Yes, you are purchasing our holiday lights and displays. We not only provide top quality commercial grade lights, but all the necessary extension cords, timers, clips, stakes, and ties to properly install the display. When we remove your display, we will remove and store all of the installation materials. Our storage of your materials is included in our pricing. We only install commercial grade products. We will not install customer-supplied products. Installing our own products ensures our quality will stay the highest in the industry. Q. Can you install the Christmas lights I already have? A. Unfortunately, we can’t install your own lights simply because we cannot validate the quality nor can we warranty them. We provide fresh new commercial grade LED lighting that is custom fit to your home or property. We also include all the essential extension cords, photocell timers, and any clips, stakes, or ties, to properly install your display. Q. Do I need to be home for the quote or installation? A. For exterior lighting, most of the time our customers do not need to be at home during the quote or installation. Our highly-trained installation teams can complete the installation whether you are home or not. In some cases, the power supply access may be inside the garage behind a locked fence or gate, and in that case, the homeowner would need to be home. Q.When do you take down the lights? A. Removals begin January 7th and continues until all customer lights have been removed (weather permitting). No appointment is necessary for removal, as for a set schedule is created to ensure that all of our customers’ lights are removed in a timely manner. Q.What if a light stops working or gets knocked down somehow? A. We make every effort to make service calls within 48 hours. Your Holiday Lighting package is covered for any defects or malfunctions. However, our repair service does not cover damage due to vandalism, acts of God, theft, damage from lawn/landscape crews etc. Q.What is the cost of storing the lights and decorations? A. The takedown and storage of all lights and decorations is included in our price. Q.How much does it cost to have lights and decorations installed? A. The cost of your display depends on the size of your home and where you would like the lights to be installed. Extra features such as trees, bushes, path lighting, and décor will also determine the price of your display. We will be happy to provide you with a custom quote.